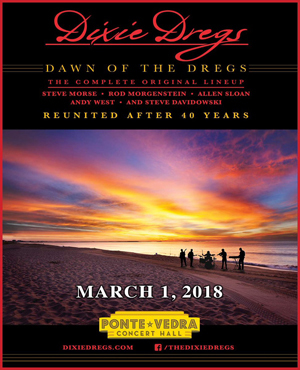 The "DAWN OF THE DREGS" 25-date tour--with additional dates to be announced soon--will take the band across the country starting on February 28 in Clearwater, FL and make stops in Atlanta, Charleston, Washington D.C., New York City, Boston, Pittsburgh, Cleveland, Chicago, Milwaukee, Boulder and Phoenix, among many others, before wrapping April 25 in Dallas, TX. For more information about the "DAWN OF THE DREGS" tour and to purchase tickets, click HERE. "This tour is the result of the overwhelming requests we've received from a loyal audience of diehard Dregheads, and new fans who have never seen us perform live, but discovered the band for the first time through Steve's membership in DEEP PURPLE, or Rod as the drummer for WINGER," said Dreg's bassist, Andy West. "We can't wait to play for them all," adds West. For guitar aficionados, Steve Morse needs no introduction, and his place in the pantheon of guitar greats is certain. But in fact, his career started with THE DIXIE DREGS. The band traces its true beginnings to the band DIXIE GRIT, which started in a Georgia high school with Steve on guitar and Andy West on bass. DIXIE GIRT morphed into THE DIXIE DREGS at the University of Miami School of Music, where Allen Sloan (violin) and Rod Morgenstein (drums) joined up with Steve and Andy, who were the "dregs" of DIXIE GRIT.